Why is Google Calendar important in an industry (social media marketing) that is notorious for burnout and being overwhelmed? Work-at-home entrepreneurs staring at a computer screen for 10-12 hours a day can start to experience a terrible disconnect from the realities of time, unless, of course, they are extremely organized. 3 years ago I was not organized and I was deep in the grip of “overwhelm.” I was staying up past midnight trying to finish my work and stressed over the work I still needed to find to pay the bills. It was not fun. And yet I was in an industry I loved and had given me a new start – a new career. I might need to back up just a bit and tell you about the phone call I got one day in 2011 from my editor at Wiley. She offered me a second book (yay!) for a good amount of money (double-yay!) but I needed to write all 300 pages in the next 30 days (not-yay). Oh no. For those of you unfamiliar with writing Dummies books, you need to know that it generally takes about 1 hour to write 1 page. Not only do you have to do the research and write the page, you also have to do the all the formatting. Yes, the formatting. And the Wiley people are very serious about their style and function of each little bullet point and paragraph. That’s when I started to use my Google Calendar in a very specific way. And over the last 5 years, I have developed a way to manage my time so I get things done and I don’t fall into that horrible place again. Google Calendar saved my sanity and allowed me to stay working in this industry… even though that banana farm in Costa Rica still sounds charming…. (right Andrea?). If you use GCal as a time-management system (instead of “dentist appointment system”) there are many features. My favorite 8 are listed below. If you are a solo entrepreneur, you probably only need one calendar. If you have many clients you might want to create a calendar for each client with just their information on it and use it as a journal of your work for them. I highly suggest you turn all of these client calendar layers on and move around the work (see drag and drop in the GIF) so there’s no overlapping in the global view. That way you will get more work done with less stress. Trust me on this one. Overlap = overwhelm. How many calendars can one have? As many as you want it seems, but beware over-using this feature. Unless you are sharing a calendar with a client, there’s no need to have one per client. 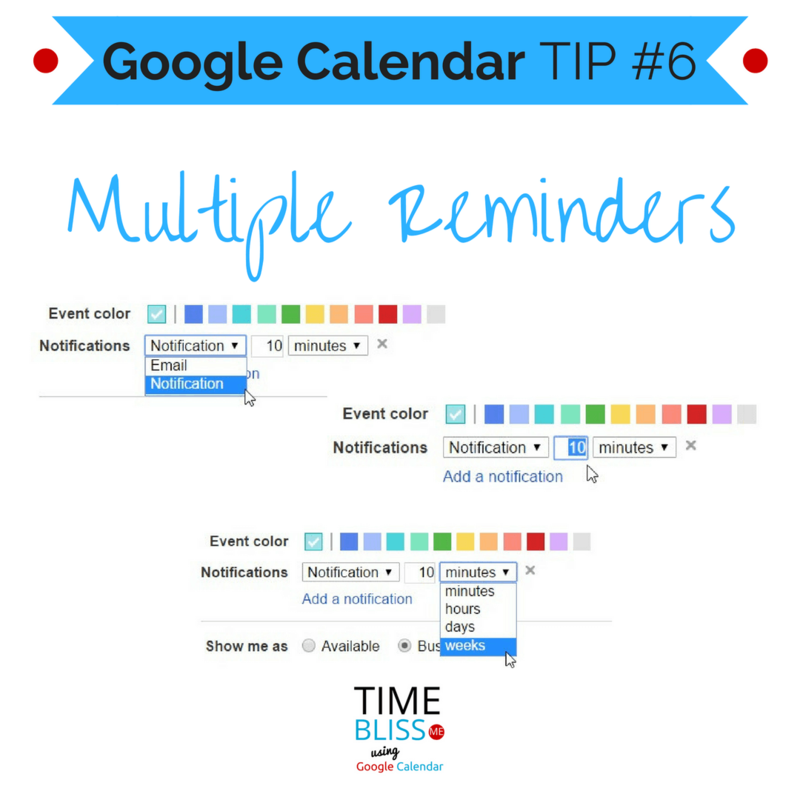 You can combine tasks for multiple clients on one calendar. 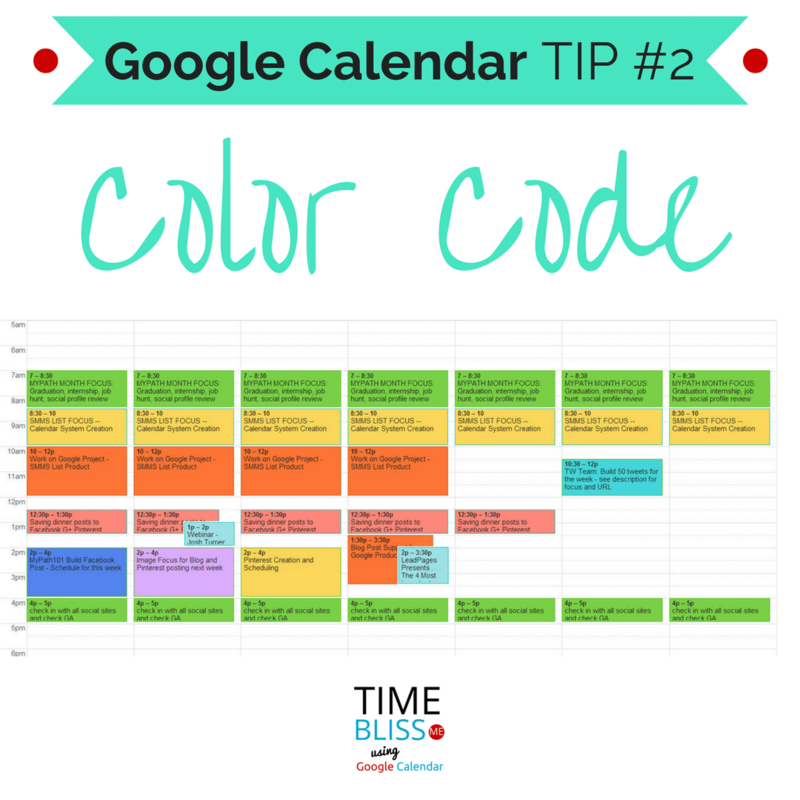 There are other ways to code the events on your calendar if you are not a color-lover. I have many tips about all of the features in this article in the program I developed for other work-at-home people called TimeBliss.ME. One of the nicest features is the feature to drag and drop these time blocks you create around. You can move them up and down in the day and week view and from day to day in the week and month view. But here’s a tip. If you find yourself moving a time block of a certain task over to the next day and then over again and again. This is your calendar telling you to outsource that task or learn to say NO to those types of tasks. When you first start to use your calendar in this way you might find you created a time block for 2 hours but it really takes you 4. If you go back to the time block and expand the amount of time it takes up (in the day and week view) your calendar will be teaching you to be more realistic about your time. So the next time you schedule this thing you will remember how long it actually took to complete. This is a great feature if you have multiple clients who want to look over your shoulder and see what you’re doing. Or if have a joint venture, you can put the timeline of the launch on the calendar so everyone knows when everything is supposed to happen. The last function is quite handy in my world. In fact, I transposed a complete mind-map of a product launch into time blocks on a calendar and it made my life so much more relaxed because I knew everything I had to do had a space on the calendar where it would get done. If you want to put one of your calendars, maybe your book signing tour dates for example, on your blog. Just use this function and get the embed code. There’s a lot to this feature, too much for this post, but an excellent feature for many people. This is a big one in my world. Once I start doing something online I pretty much lose track of time. You, too? I have reminders set up for each time block in my calendar. 10 minutes before the next item starts I get a popup notification. It breaks my flow enough to cue me to complete what I’m doing and get ready for the next thing. Or I can go back to the calendar and move things around to make time to complete my current task. These reminders are completely adjustable to suit your brain; email or notifications or both, minutes, days, hours, or weeks in advance, and on multiple devices! Amen for this integration. This one feature allows me to be out and about when I want and not miss anything. 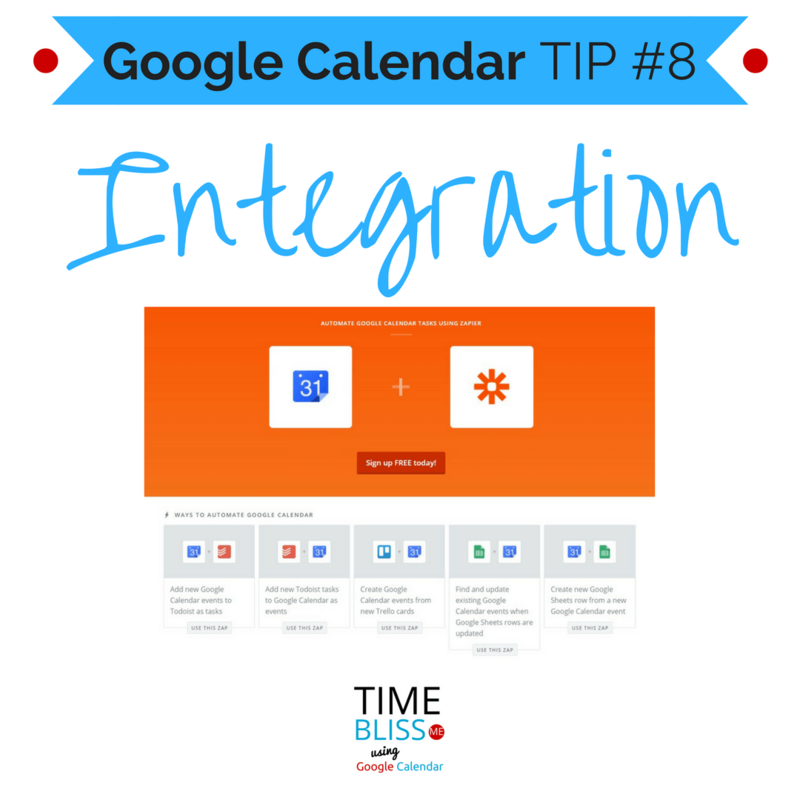 If you use appointment systems like ScheduleOnce (or any number of systems) having it integrate with one or more of your Google Calendars is a great time saver. 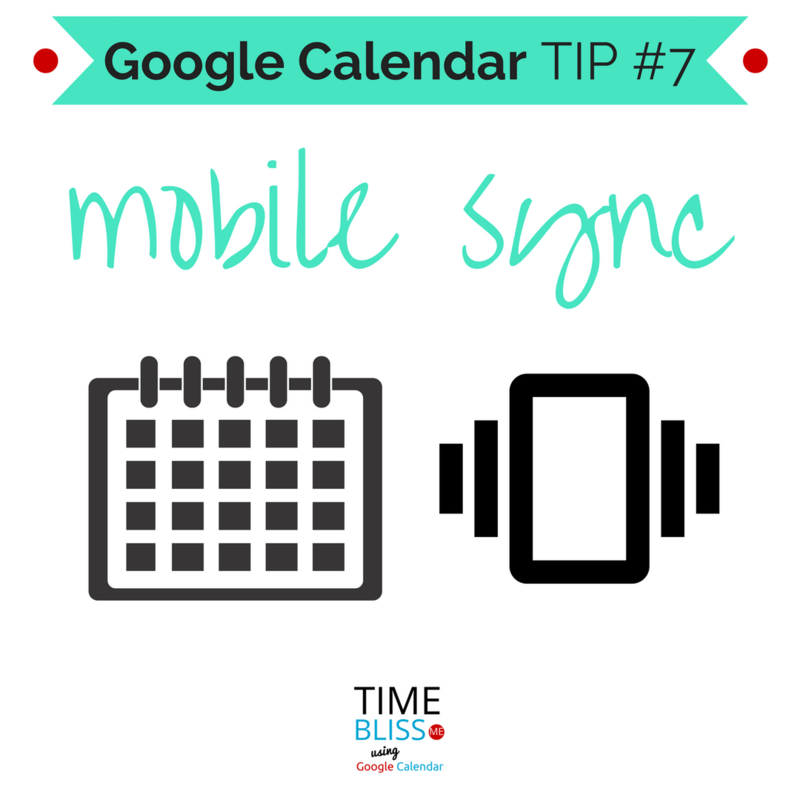 You can sync it with your calendar and send the link to your email list for scheduling appointments with you. You don’t even need a third party system for this, but that’s another post for another time. This is the short list of what I consider some of the best features of using Google Calendar. If you are a busy entrepreneur, learning how to use Google Calendar will increase your productivity and give you some powerful lessons in managing your time. If you are still making little To-Do lists (that don’t get done) or if you feel controlled by time (I don’t have enough) or you feel overwhelmed, do yourself a favor and just try this one step: put everything you have to do today on a calendar. Everything. Seriously everything. Create time blocks for each of those things and you’ll see very quickly the realities of time. And then listen to what the calendar is telling you (outsource, say no, give to a team member, learn to let go, go play with your family). I enjoy this subject immensely, so please feel free to reach out to me. Let’s talk about it. I can’t wait to read your comments! 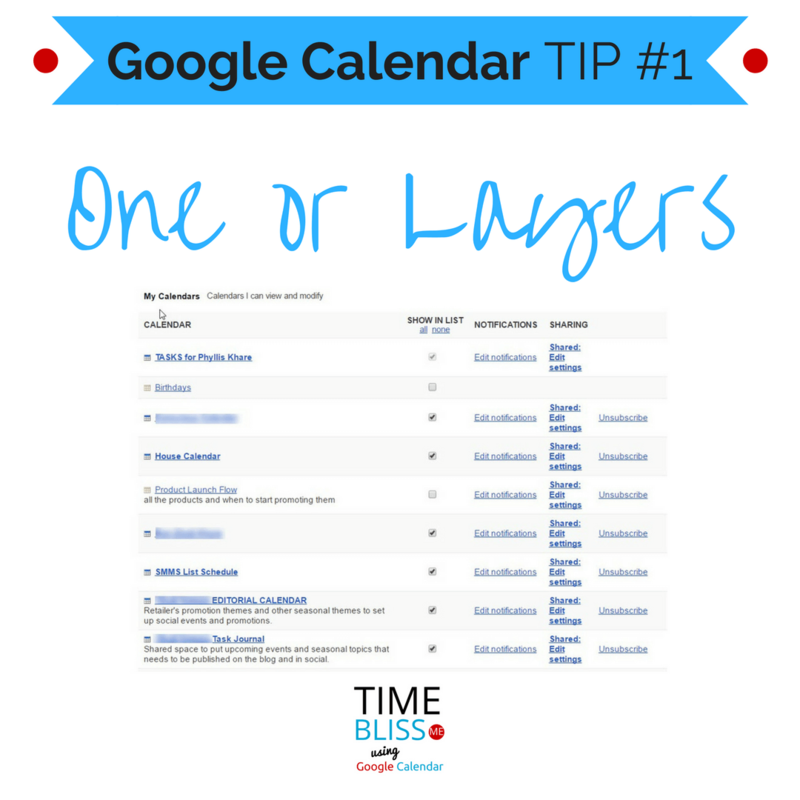 If you want to dive deeper into using Google Calendar for your own time management woes, check out TimeBliss.ME. 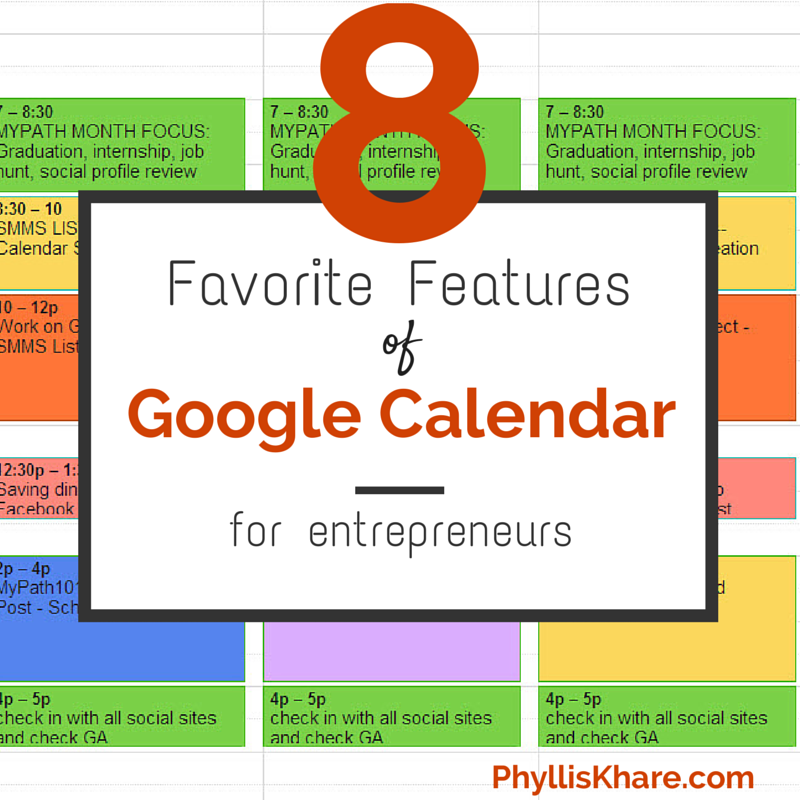 Great overview of some of the great features of Google Calendar Phyllis 🙂 It is so versatile and a great time saver and tracker. Yes. Love the Google Calendar! And Yes IFTTT is a super tool to use, too. Thanks for stopping by Clive. Love how you bring the overwhelm into a post that makes me know that I can get more organized with these great steps and tools. THANKS! Thanks +PhyllisKhare! You are always providing such great info & tools for all of us to use! I love Google calendar! Hi Phyllis. One of the downsides of the notifications is that while it can remind you it can’t remind your clients (if that’s what you use Google Calendar for). I’d love for you to review my product at appointmentreminder.info and see how it integrates into Google Calendar. What an informative, and visually helpful post. I popped over here from your video post on Facebook. You know I am indebted to you for introducing me to Google Calendar. I use it a little differently for my multiple clients, but I have NO idea how I would have survived as a Social Media Manager without this tool. Thanks again Phyllis. Thanks so much Trena. I feel the same way about Google Calendar! Don’t know where I would be without Google Calendar.